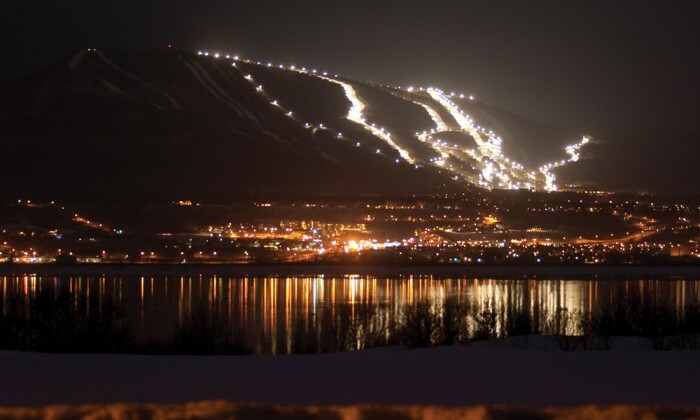 More than a dozen of Mont-Sainte-Anne’s 71 trails remain floodlit, making them the highest vertical drop for night skiing in Canada. Perched upon the peak of Mont-Sainte-Anne, it takes a bit longer to tighten the bindings. There are distractions: there is silence, there is nature and there is the gray-blue St. Lawrence River flowing below. Historic and quaint Quebec City is a faint black dot on the horizon in this world of white. Veins of pine trees stretch across the region and dark red chimneys arterially puff smoke. The sun hitting the peak made it feel warmer than the unusually cold minus 4 degrees Fahrenheit this particular morning. I looked on as a fellow skier rhythmically navigated the snowy trails like a moth steadily swerving toward light. Following his cue, I headed down after him toward the river. The trails, combed earlier that morning, were still etched with the groomer’s markings. Some skiers exited the gondola and rode the peak’s ridge toward the trickier part of the mountain, where diamond and double-diamond-rated trails rise nearly vertically. Thus, the mountain stayed empty for most of the day, making it easy to pack the hours with runs. 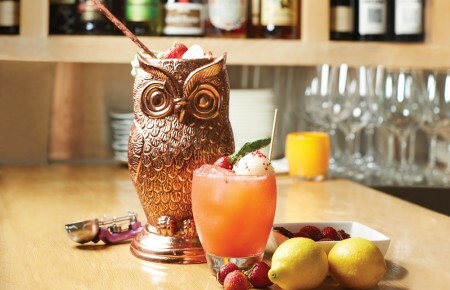 Alas, when hunger hits, the lodge calls. It’s easily accessible via La Pichard, a gentle blue trail. Yet, halfway to the bottom, sets of abandoned skis betrayed a cabin in the woods. In front of it, the owners of said orphaned gear gathered around a trough inexplicably licking some kind of popsicle sticks. The only man not licking held a carafe. He is the assistant to the maple syrup farmer, an elderly fellow stationed in the cabin prepping the next batch of syrup. For decades, the farmer and his associate have snowmobiled up to this mid-mountain farm stand to pour warm maple syrup onto snow-packed troughs, transforming the syrup into taffy that is rolled onto the sticks. The snow melted as soon as the taffy hit my mouth, replacing lunch and leaving more time for the beckoning activities. 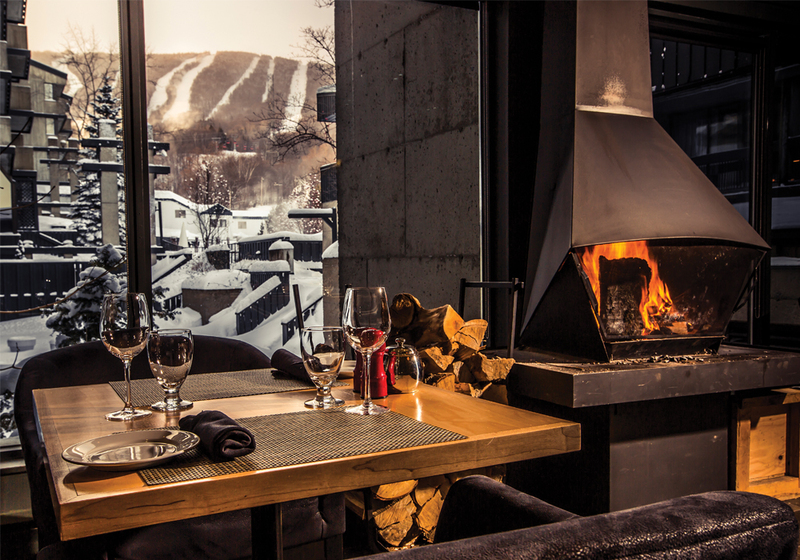 Bistro Nordik, nestled inside Château Mont-Sainte-Anne, features a seasonal menu in a cozy après-ski atmosphere. Mont-Sainte-Anne provides adventures for all levels of daredevils. One of the best is alpine touring. Unlike most resorts, where alpine touring skiers dishearteningly trudge up on the shoulders of downhill trails, Mont-Sainte-Anne has created picturesque paths that run through the forest for the hike up. For families, the mountain provides hundreds of sleds at the base, making it easier for parents to drag their brood and gear with few complaints. About five miles from the chairlifts is the famous cross-country ski park boasting more than 120 miles of trails that wind through the Laurentian forest. This network is the longest skiable terrain in Canada. Olympians frequent the slopes here, but even amateurs move like thoroughbreds on a track. By way of contrast, when I cross-country in Bethpage State Park, I’m usually one of the fastest. But in the evergreen forest of Mont-Sainte-Anne a few dozen skiers stampeded past me, charging up the hill and leaving me in their powder. Newly deflated ego in check, I raced beneath bare maples and lush pines, working the inclines, accelerating down slopes and enjoying the woods around me nevertheless. Those interested in snowshoeing have their share of paths to hike too. And nearly 20 miles of trails are dedicated to fat biking, a sport that mounts thick-wheeled tires on bicycles so they are equipped to ride on the snow. The trails appeal to all levels, including the occasional stubborn moose blocking a path and rerouting winter recreationists. Next door to the park is the cure for sore muscles: Le Nordique Scandinavian spa. Banish any thought of white robes and blissful serenity, Le Nordique’s prescribed treatment might be more ferocious than any of the activities detailed thus far. To begin, spa-goers spend the first 10 minutes in saunas or steam rooms reflecting on the day. Then comes the challenge: stepping barefoot into the frigid outdoors and plunging into a near-frozen lake or the cold pool where even the metal handrail is encased in six inches of ice. The proprietor’s instructions for phase two are quite specific: dunk at least neck deep into the icy water and tolerate for as long as possible. 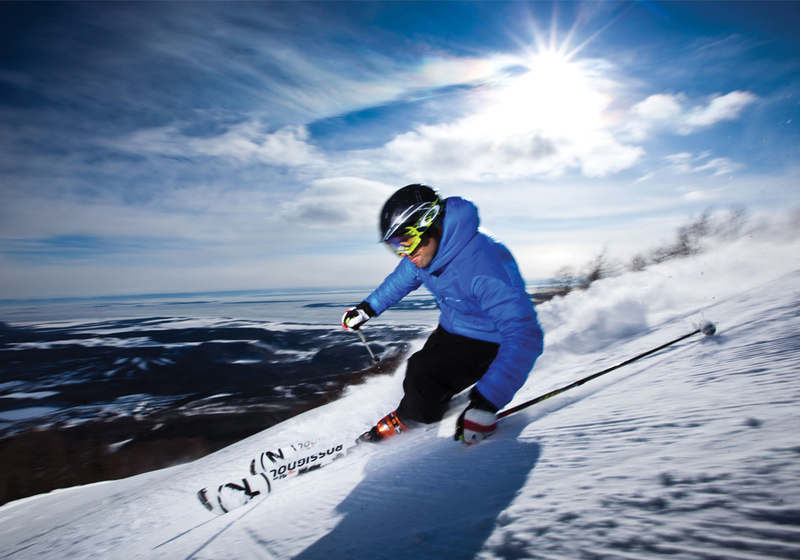 The famed cross-country ski park boasts more than 120 miles of trails that wind through the Laurentian forest. The final step, though less traumatizing, is yet another challenge: spend 10 minutes doing absolutely nothing in a heated yurt. Inside, guests appear depleted and lost, yet at peace, as if they were under the influence of ayahuasca and abandoned by their shaman. Still, everyone seems aware of his internal clock and when 10 minutes passes, abandons the yurt to begin the process again. Repeat as necessary, finish in the hot tub watching the sun set on the icy day. The ski retreat is little more than a half an hour drive from Quebec City, which feels as if a European city had floated across the Atlantic and lodged itself wonderfully into North America. 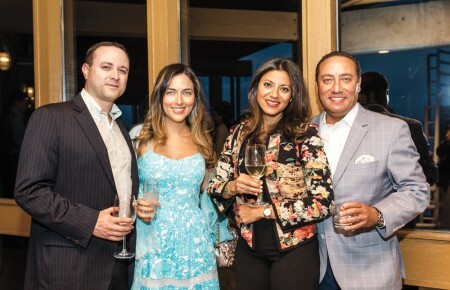 Although dining at the mountain is simplest, the lack of restaurant options and the proximity to Quebec City make it worthwhile (and certainly more appetizing) to head for the heart of the Old City. Parisian-style bistro L’Entrecôte Saint-Jean prepares the best steak frites in town. Alternatively, in Lower Town, the streets are lined with quaint shops that seem apropos of the North Pole (should the elves consider new lines of commerce). There are fudge shops that serve jalapeño hot chocolate, as well as lovely cafes. Le Cochon Dingue’s famous ribs also provide another meal unfathomable at the mountain.